After seeing Kiinalik: These Sharp Tools at Buddies In Bad Times Theatre, watching the interplay of languages — English and Inuktitut and the low embellishment of the cello, theatre and dance and music, folk song and throat singing, tools and weapons — I am sure that my attempts to describe this extraordinary, affecting performance in a single-dimensional medium can only fall short. If you want to experience it for yourself — and oh my stars, I believe you do — click over and get tickets this minute (the run is deservedly almost sold out already). Because you cannot sit riveted by fear and excitement while Laakkuluk Williamson Bathory challenges and seduces her way through the audience by turns performing uajeerneq, a traditional Greenlandic mask dance, on a video. You cannot experience the deft, responsive live scoring of a complex and evolving show with Cris Derksen right there in front of you, smiling and responding through her futuristic carbon-fibre cello in steady conversation, on a video. And you cannot really appreciate the bare honesty of Evalyn Parry setting the frame and then receding slightly but surely, marking the yielding of colonization to the power of indigenous sovereignty reasserting itself, through a video. They could only be approximated. On a video, the thing has already happened; the outcome is fixed forever in time. The dynamic interplay that this remarkable piece of performance work contains, the give and go, the responsiveness and connectedness and obvious respect and affection can only be properly understood live, with your galvanized skin and resonating bones in the same room as these three estimable women, where you find yourself fortunate beyond measure to be breathing in the same space as they are. There are touches to Kiinalik: These Sharp Tools that bring the entire thing home, truly. Somewhere it dawned on me that all three performers were wearing sealskin accessories, shoes or belt or wristband, in solidarity with the Inuit seal hunters. In the show’s conversation about the erasure and co-opting of Indigenous ways of life and work, even that felt pointed. 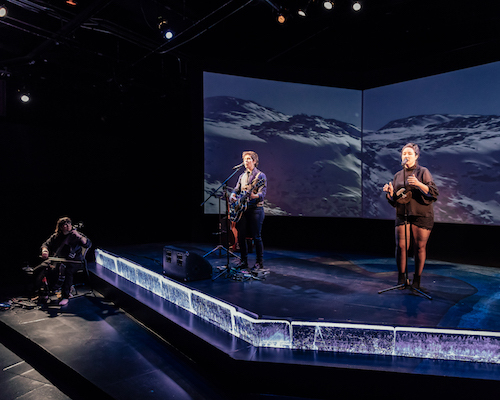 The set is literally bounded by ice, and the actors cross and recross it repeatedly as they bring pieces in and out of the protected space it makes in designer Kaitlyn Hickey’s set. While Parry (who has made and performed several pieces of work about climate change in recent years) and Bathory moved back and forth, speaking eloquently about the power of ice, it was Derksen’s tiny gesture to the ice that moved me most. I happened to be looking during a rare moment that she wasn’t playing and mixing and noticed her reach out and touch an ice block with a small but intentional gesture that looked like grounding, like prayer, like appreciation, like both seeking and giving reassurance. I am neither clever nor deft enough to understand how ice might respond to such a touch, but imagining that alone feels like another entire evening. Kiinalik: These Sharp Tools deserves to run forever, to be heaped with laurels, for the performers to be born aloft in the streets as an example of how to do the thing brilliantly. Go. Tickets range from $20-$40, with PWYC matinees on Sunday. Tickets can be purchased by phone at 416-975-8555, at the Buddies in Bad Times Theatre box office, or online here.